In Japan, the early 2000s marked a turning point that witnessed the progression of lowered birth rate and an aging society, resulting in a transition to a society that was characterized by rapid population reduction. This was accompanied by the establishment of a social/regional structure that significantly differed from a society with rapidly expanding population, as demonstrated by a one-time high economic growth period. Thus, it is important to create a social environment to enhance a system for facilitating the creation of a space for a “shrinking society” that corresponds to these types of new social/regional structures and to promote consensus. Therefore, the “Department of Town Planning and Design” was established, based on existing fields of knowledge such as civil engineering, construction systems, and landscaping systems, by the College of Science and Technology, Nihon University in April, 2013. Their goal is to acquire basic knowledge and technical skills and to practice town planning through urban and regional strategies that match the strategies of the above described new era. Furthermore, a “Department of Master Course for Town Planning” (Graduate School of Science and Technology, Nihon University) was established in April, 2017, for promoting advanced research that contributes to town planning engineering, fulfills a leading role in the field of urban development, and realizes the human resources capable of international activity. This course involves imparting knowledge related to four categories; town and regional management engineering, environment/disaster prevention town planning engineering, landscape/tourism development engineering, and health/welfare town planning engineering. The aforementioned knowledge is based on civil engineering and architecture studies and includes knowledge on advanced town planning. This includes interdisciplinary areas such as environmental engineering, disaster prevention engineering, tourism, landscape architecture, horticulture, welfare, and human engineering. 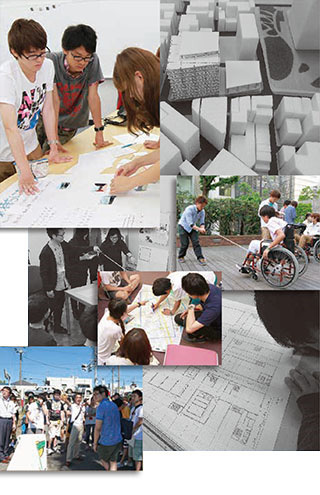 In preparation for the master’s thesis, the main research subject will include courses related to various aspects of town planning in Japan with respect to a mature society, grasping problems from a broad perspective, proposing solutions based on advanced knowledge, and realizing methods for the aforementioned challenges.